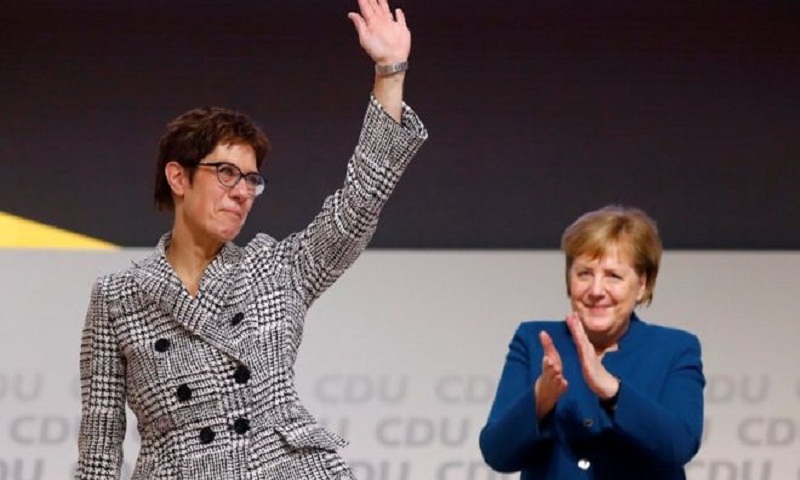 Germany's ruling Christian Democrat Union has chosen Annegret Kramp-Karrenbauer as its new party leader, ending Angela Merkel's 18-year reign. The CDU general secretary narrowly beat Friedrich Merz, a millionaire lawyer, in a run-off vote in Hamburg. Ms Kramp-Karrenbauer, or AKK as she is also known, received 517 of 999 votes. Mrs Merkel, who plans to serve out her term as chancellor until 2021, gave an emotional farewell speech on Friday at the special party conference. As the head of Germany's largest party, Ms Kramp-Karrenbauer could now become the next German chancellor. The former prime minister of the state of Saarland said: "I learned what it is to lead, and above all learnt that leadership is more about being strong on the inside than being loud on the outside." Popular in her home state of Saarland and Berlin, she has an unpretentious style and a reputation for calm analysis, as well as political acumen. Ms Kramp-Karrenbauer joined the CDU as a student in 1981 and rose up the ranks of state-level politics. The devout Catholic was seen as Ms Merkel's heir apparent and protégé. Ms Kramp-Karrenbauer became the first woman to serve as a state minister for internal affairs in 2000 and the first woman to serve as prime minister of Saarland, a position she held from 2011 to 2018. She is a Merkel loyalist, perceived as someone who will replicate much of the chancellor's style and policy. However she has differentiated herself from her mentor, voting in favour of quotas for women on corporate boards and taking a tougher line on Russia. She is also more conservative on social issues such as gay marriage, and has vowed to review the country's position on security and migration.